Captain Mike Wilbur is the owner of the Chaser. 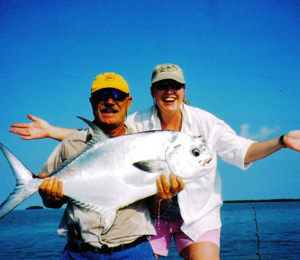 Captain Mike has been leading fishing charters since the 1970’s. With Captain Mike you can choose between fly fishing or spin fishing. The majority of charters that Captain Mike leads are in the backcountry of the Lower Florida Keys. In this area you will find plenty of species that are all worth their weight in gold. Prepared for nearly everything, Captain Mike has experience working with anglers with plenty of experience and with little to none. Captain Mike loves his job so you will not find one specific type of person aboard his charters. He likes the variety that comes with working with different types of people. When working with Captain Mike you will be working with a passionate and knowledgeable guide. It is important to have fun in everything you do and Captain Mike ensures that during your trip you will be able to have plenty of good times. The fish on the menu will vary based on the trip, but it is possible to find and catch numerous species. Some of the most popular catches in the area include Bonefish, Redfish, Snapper, Jacks, Permit, and Tarpon. Of course, there are many other types of fish in the area so you might not want to limit yourself to what is here on the list. As you progress in your experience you might be interested in landing a shark or catching a barracuda. A great time is on the horizon when scheduling a trip with Captain Mike on the Chaser. Everything you need will be provided to you including bait, tackle, licenses, and poles. You might want to consider bringing some snacks and beverages to ensure you are more comfortable. Additionally, you should consider bringing white soled shoes, sunscreen, and some sunglasses. Captain Mike is ready and waiting for your fishing excursion to begin. Lasting memories are sure to be made as you enjoy a long and exciting charter on the Chaser during your time in Key West. I have been to the Bahamas many times, but The Chaser is one of my favorite trips! It includes everything that everyone should do here. As a Bahamas veteran, I can say only the best about this experience!